Hello there! 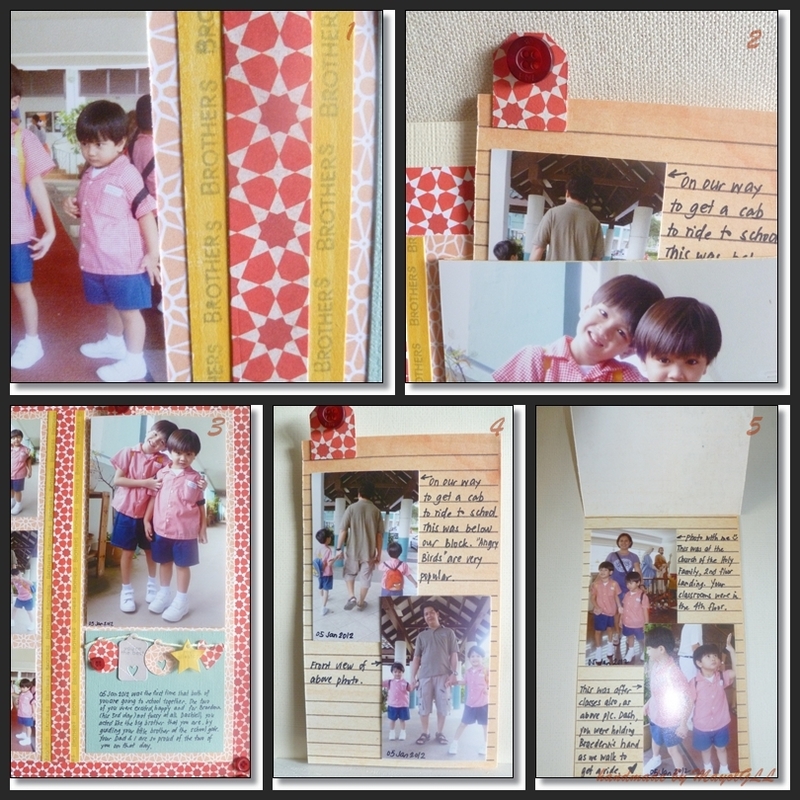 Am posting today my first scrapbook layout for 2012 - yaaaay! :) The last page i made was back in September 2011. I somehow got "overwhelmed" with doing layouts at the time and leaned to doing smaller scale projects. Turned out i got so much Christmas crafts and cards done than i originally planned, and it was a pleasing outcome. Have rotated the sketch to it's side. I tried to match the patterned paper with the boy's uniform. I am a color/pattern-challenged girl (card/layout color challenges scare me) and am so grateful the PPs i used came from a kit so i don't have to "suffer" trying to coordinate stuff LOL! The page is about my sons' first day together in school. It's actually my youngest one's 3rd day in school here as the older kids go in a couple of days later. This year is my youngest's first year in pre-school and it just makes my heart swell seeing these photos. Description: (1) stamped "BROTHERS" on the yellow PP; (2) a pocket behind the main photo; (3) Tiny Tags on the journalling area, with stamped sentiments on a couple of them; (4) first page of the insert; (5) second page of the insert. Supply list: Cardstock - Bazzill; patterned papers - Studio Calico, Echo Park, Sassafrass Lass; stamps - Papertrey Ink (PTI) Tiny Tags II; dies - PTI Tiny Tags, Alphabet Blocks; buttons - PTI; twine - My Mind's Eye; washi tape - American Crafts; ink - Memento London Fog; adhesives - Helmar, Claudine Helmuth Studio, Ranger Wonder Tape. Thank you for taking time to visit! This is fabulous! I love how you turned the sketch on the side to make it work for you! And that little banner of tags is adorable! I'm going to have to remember that idea! Thanks for playing along with my sketch! Nice layout. i too have trouble matching pattern papers. Love the line of tiney tags. Your kids are so cute. Love the uniforms. Good for you for getting back to scrapping. Love your take on the sketch! And the hidden journaling with more photos, wow! We've got to see more! Thanks for sharing!